Heritage IGUs are about low sightlines but come at a potential cost in performance. There are a number of drivers currently converging which make the energy efficiency of older and period properties, including their windows, increasingly important. The only exemptions from the Minimum Energy Efficiency Standards (MEES), which came into force in April 2018, are for listed not period buildings, driving energy efficient improvements in rental markets. Increased heating costs coupled with the availability of grant awards for improvements to the energy efficiency of period properties is doing the same in the wider domestic and commercial markets. The net effect is that demand for energy efficiency improvements in period buildings is on the rise and that’s driving demand for slim sightline heritage IGUs. “We’ve been supplying heritage units since 2011”, says Mark Norcliffe, Sales Director, Cornwall Glass. “Our customers tend to be joiners contracted to work on period installations, while we also supply units into steel Crittal-type replacements, manufacturing around 6,000 heritage IGUs a year. “What you face is a real pressure to get sightlines down to a minimum. The problem is the point at which you lose performance?”. 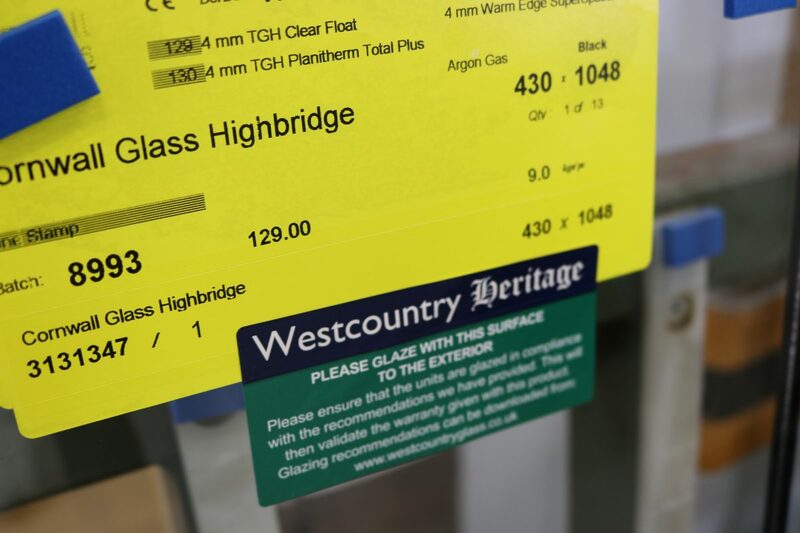 Of the 42,000 heritage IGUs supplied by Cornwall Glass, there have only been a ‘handful of failures’, something Norcliffe attributes to the specification of its heritage IGU but also its manufacturing process. “We make every single heritage window by hand”, he says. “What’s more is that we have the same three guys working on the hand line as we did when we started in 2011. They own it and are incredibly detailed in their approach to manufacture”, Norcliffe says. The Cornwall Glass Heritage IGU has been designed to replicate the slim sightlines of a period window. Manufactured in either Pilkington K or Planitherm 4mm glass with a choice of 4mm 6mm and 8mm cavity, and 90% Argon or Kryton-filled, it delivers U-values go as low as 1.1W/m2K. Sightlines are 8mm including a 4mm spacer bar and sealant, with a choice of white or black spacer bars. “There are people who offer lower sightlines, some even go as low as 2mm but we aren’t going there. If you’re only using 2mm of sealant it takes nothing to puncture it and lead to failure. 4mm is the same as our standard unit which allows us to underwrite the performance of the window”, continues Norcliffe. The supply – or more accurately the performance of heritage units – has been highlighted as a key issue for the industry, Glass Times reporting last month [Sept.] on an installation in Rochdale. This incorporated non-conforming glass units that didn’t contain the argon gas they were claimed to contain, despite being stamped with EN1279-5 a legal requirement under the Construction Products Regulation. Norcliffe continues: “Without commenting on any individual case, in my experience of the industry I think it’s highly unlikely that anyone is passing-off product deliberately as being something it’s not. If, however, you’re running a very thin line of sealant on the IGU because you’re trying to bring the sightline down, there are always going to be risks. Norcliffe argues that glazing using heritage units also requires increased care. 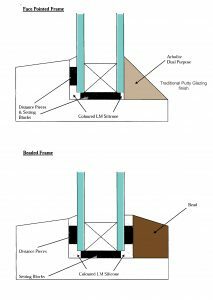 “If the unit gets to site without damage, it requires infinitely more skill to glaze the window compared to installation of a standard IGU. 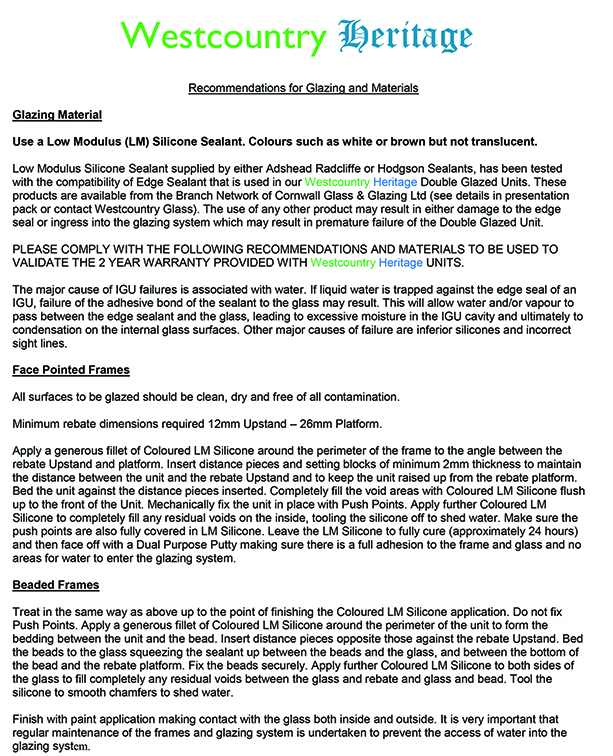 Cornwall Glass has published a series of recommendations for glazing and the use of materials in heritage unit installation. This includes a minimum rebate up-stand of 12mm and 26mm platform on face-pointed frames. “You need a suitable sealant. We recommend a coloured LM Silicone, which you need to run around the perimeter of the frame to the angle between the up-stand and the platform, plus the use of distance pieces and setting blocks to keep the unit raised up from the rebate platform. “It’s really important to fill in any voids and tool-off the silicone so that it sheds water. Once it’s fully cured you can go back and then face-off with putty. We recommend Arbolite Dual purpose which gives you a really good adhesion to the frame and glass. “The process for beaded frames is the same up to the point of finishing. You need to run a fillet of silicone around the perimeter of the unit and then push the sealant up between the beads and the glass as you bed the beads into the frame. Gary Cartwright is one of three specialists, working on Cornwall Glass’ heritage IGU line. Working on the hand line since it was set up in 2011 he brings a high degree of skill to the role. “We work to fairly high volumes at the same time as to a high degree of detail”, he explains. “IGU manufacture is pretty automated, when I’ve worked on standard lines you’re working on just one process whether that’s cutting, toughening, edge work. Working on heritage units you’re involved in all of the processes involved in manufacture. 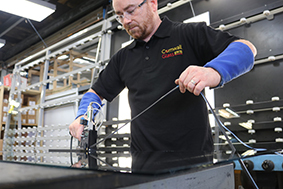 Gary is one of three Cornwall Glass ‘colleagues’ working on the glass processor’s dedicated heritage line, alongside Damon Kent and Luke Thomas, his colleagues also starting on the line in 2011. “You’re working to a high degree of precision. The product is all about the finish”, Gary continues. “We’ve now been doing it for seven years using the same sealants and the same heritage spacer bar and we get very few failures or re-makes. “As a team we take a lot of pride in what we’re doing. It is about craftsmanship. That’s very different to where most IGU manufacture is going because it’s about bigger and bigger units which need to be made on automated lines because of their scale.